Susan Kelliher Ungaro / Photo by Susie Cushner. Susan Kelliher Ungaro, president of the James Beard Foundation, focuses on furthering the famous chef’s legacy – and on what’s really important about a meal. As I pull open the heavy door of the James Beard House on West 12th Street and 7th Avenue in Manhattan’s West Village, the first thing that hits me is the smell. Chestnuts roasting, shallots caramelizing, the unmistakable and glorious aroma of the very best meats prepared by those who really know what they’re doing. This is what the James Beard House smells like over 225 days of the year, as chefs from all over the country and the world come to “perform” at fundraiser dinners in the Beard house. And that’s not even the main reason why Susan Kelliher Ungaro, appointed President of the James Beard Foundation in 2006, took the job. “I loved what James Beard stood for,” Ms. Ungaro muses as we sit in her cozy office at the top of a creaky yet grand winding staircase, on the third floor of the 1844-built brownstone. 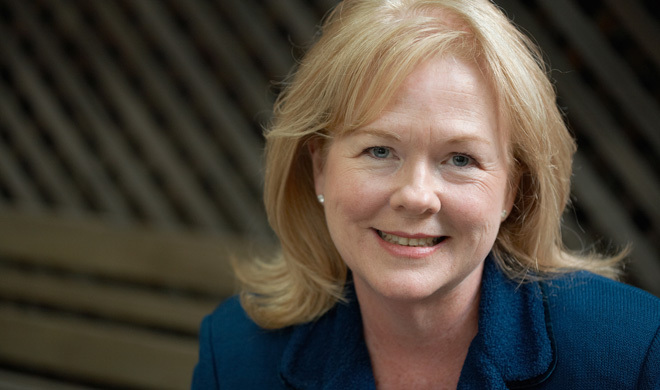 Susan Ungaro came to the James Beard Foundation after 12 years as editor-in-chief of Family Circle magazine, where she celebrated her 25th anniversary in 2001. Since joining the Foundation, Ungaro has pioneered a multitude of initiatives to further the Foundation’s mission of celebrating, nurturing and preserving America’s diverse culinary heritage, and helping to lead the complex future of the nation’s relationship with food. “The James Beard Foundation is going to be celebrating our 25th anniversary in 2012,” Ms. Ungaro says with true enthusiasm. “It’s a very exciting time for us. Anniversaries are important hallmarks of having not only survived, but succeeded –making a difference and making a mark in what you want your foundation to represent.” A new book called The Best of the Best celebrates 25 years of America’s outstanding chefs, and this May’s James Beard Awards will continue to celebrate James Beard’s legacy. The increase in public awareness on such “food politics” issues in recent years might be new to some, but they are an enduring part of Beard’s philosophy. “James Beard was talking about cooking in season long before it was trendy,” explains Ungaro. When Joe Baum opened the famous Four Seasons restaurant in New York in 1959, Beard was brought in as a consultant and helped to create the initial concept of seasonality in changing menus.“So many more restaurants now, not only do they tell you today’s menu but they tell you what artisanal cheese maker, where the lambs were slaughtered, where the fish came from,” says Ungaro. “It’s a sign of caring – from the restaurant’s point of view – about educating their diners about where their food comes from… I think what [the Foundation has] done in this country, and the media has helped this tremendously, is that we’ve raised people’s consciousness about words like “food miles,” “cooking in season,” “artisanal.” All those words are really changing how people think about shopping at the supermarket and what they put in their bodies. You are what you eat, so know what you eat. That mantra is something that we really endorse. Beard’s own beginnings were those of aspiration and determination, and his approach to cooking as both an everyday affair and an opportunity for greatness still resonates with many today. Beard grew up in a boardinghouse his mother ran in Portland, Oregon, and when he came to New York, he opened a successful catering company for hors d’oeuvres and canapés that inspired his first cookbook. Beard made a name for himself as an author (eventually penning 24 cookbooks), a teacher, and a pioneer in food television. Ungaro remembers “episodes of Beard on the Today Show with a young Bryant Gumbel and a young Tom Brokaw, teaching them how to make homemade pasta and roast chicken. Back then, food was a new kind of content for programming.” In fact, those early episodes were filmed in James Beard’s kitchen, long before in-studio kitchens on talk shows became common. The role of women in the cooking and food industry has been complex, fraught with a history of the unpaid labor of homemakers and the skills of truly talented home cooks taken for granted, followed by decades of women going without recognition in a chef-glorification culture dominated by men. Ungaro has overseen a time in which that is slowly changing, not least with the Foundation’s 2009 focus on Women in Food as a theme. As a multiple award winner, a participant in President Clinton’s Women’s Roundtables, and someone who was honored by President Reagan’s Office for Consumer Affairs for her “outstanding contribution to increasing consumer awareness in America,” Ungaro is a strong example of that power. After my conversation with Ms. Ungaro, I’m lucky enough to get an insider’s tour of the James Beard house, from the back patio where guests at the culinary arts organization’s regular fundraiser dinners sip cocktails, to the stove where, tonight, Aimee Olexy and Sean McPaul of Talula’s Garden in Philadelphia are preparing a meal that includes fig-brushed beef rib brochettes; hand-raised hens with savoy cabbage, royal trumpets, and chicken liver compound butter; and sweet November scallops with butternut broth, black walnuts, and Asian pear cider reduction. Experiencing food culture in a place as historically saturated as the Beard house, I wonder if this generation is missing out on something, and if so, where they can find it. These days, young people are less likely to find a classic recipe or learn a new technique from a cookbook than on a food television show, on a recipe website or in a cooking app downloaded to their iPhone. But Ungaro is largely optimistic about the power of technology to make great food accessible to a wider demographic.